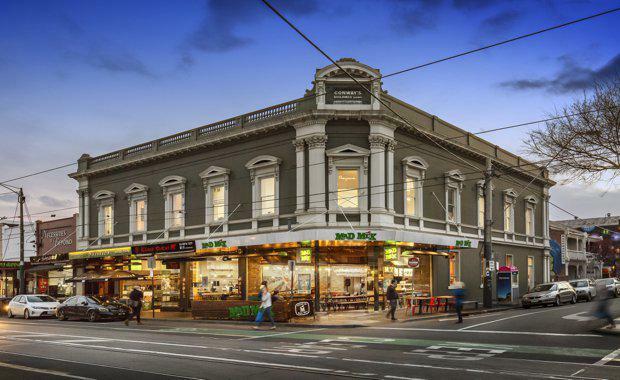 A prominent two-storey retail asset at the Windsor end of Chapel Street sold under the hammer for $14.96 million. Colliers International’s Tom Noonan and Ben Baines, in conjunction with Hocking Stuart Commercial’s Kenny Oliver and Charles Carty and ASM Commercial’s Andrew Manos, auctioned the high-profile building at 125-131 Chapel Street, kicking off the bidding at $11 million in front of a 200-plus lunchtime crowd, with four parties vying for the prize. After almost 30 minutes and 74 bids, the building was knocked down to a local private investor, who joined the fray late at the $13.8 million mark. The property was then fought over in the final stages to almost $2 million over reserve with $10,000 increments. “The record sale is reflective of the significant capital targeting premium retail investments in prime strip locations with long-term growth prospects,” Mr Noonan said. Mr Baines said it was only the third $10 million-plus sale to occur on Chapel Street in the past five years, following the sale of of a property at the corner of Toorak and Chapel Street, South Yarra ($12.85 million) in 2013 and Hudson House at the corner of Chapel and Carlton Streets in Prahran ($10.8 million) in 2014. The property is 100% leased to a diverse mix of retail tenants, including Mad Mex, Kuma Sushi, Basilico and Lucky Liquor, as well as first-floor office tenants Reymond Communications and Yoga Australia. Mr Carty said the vendors purchased the asset for $3.2 million in 2007. “They have seen Chapel Street, Windsor transform from an eclectic mix of fashion and service retailers to a thriving food and entertainment precinct,” he said. Mr Baines said the continual gentrification of Chapel Street, Windsor was expected to provide the purchaser with strong positive rental reversion well into the future.